Mathlete’s birthday always falls very close to Labor Day. So, to celebrate a day off from work and his birthday, we usually throw a fun Labor Day barbecue with friends and family. It is the perfect way to close out the summer and get in one last day party before the fall weather starts to set in. Of course, no party is complete without delicious food, especially yummy dips, to enjoy while the main meal cooks. 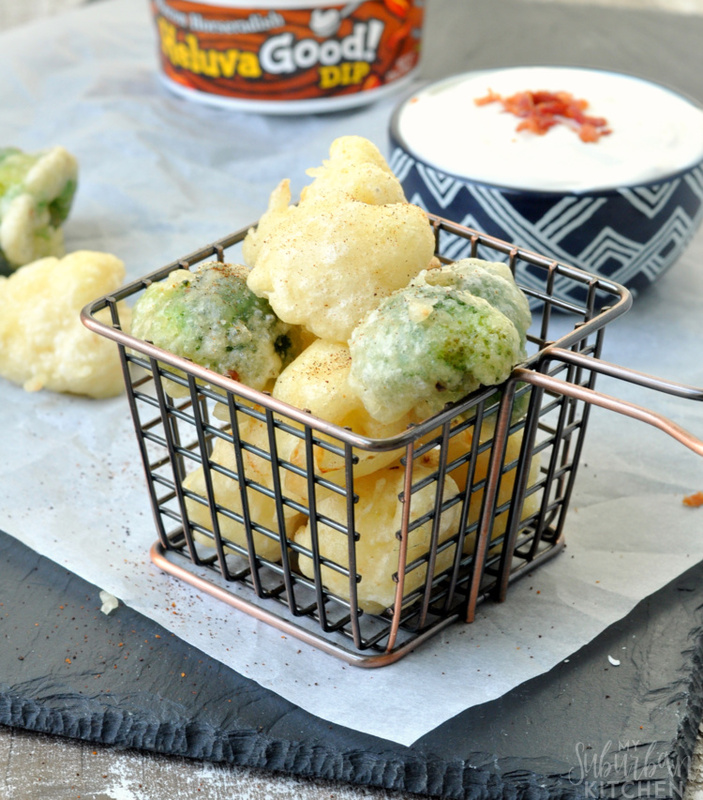 For this year’s party, I am super excited to make tempura cauliflower to go alongside the Heluva Good! Bacon Horseradish dip we are currently drooling over. 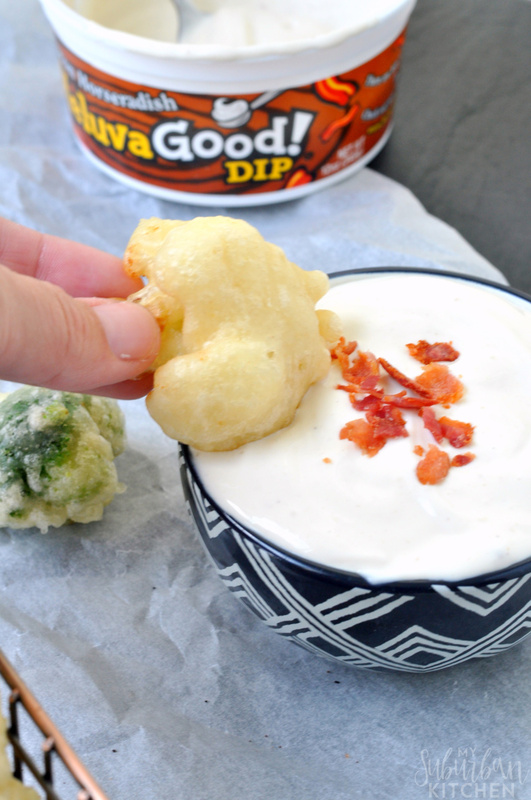 Now, every party you go to features some kind of chip and dip combination. But, I think it is time we get a little more creative with our dipping options and branch out beyond chips or even just plain vegetables. 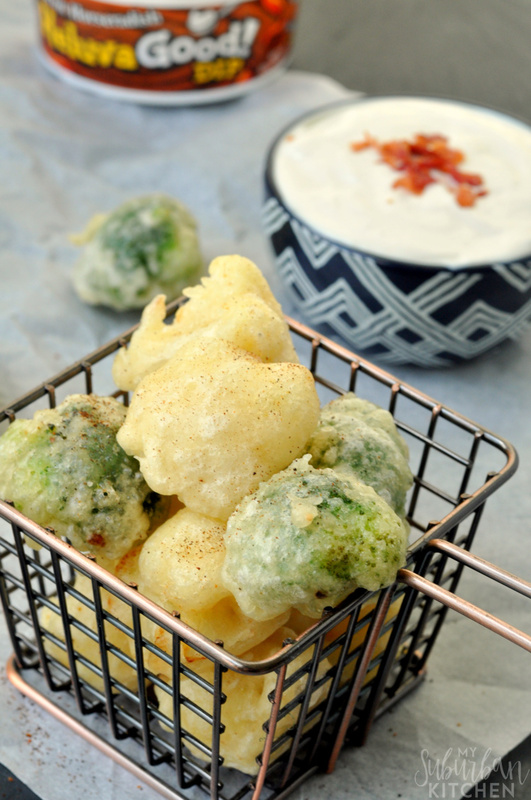 Cauliflower is all the rage right now so I decided to make cauliflower tempura (and a few broccoli tempura pieces too) for our party. Heluva Good! 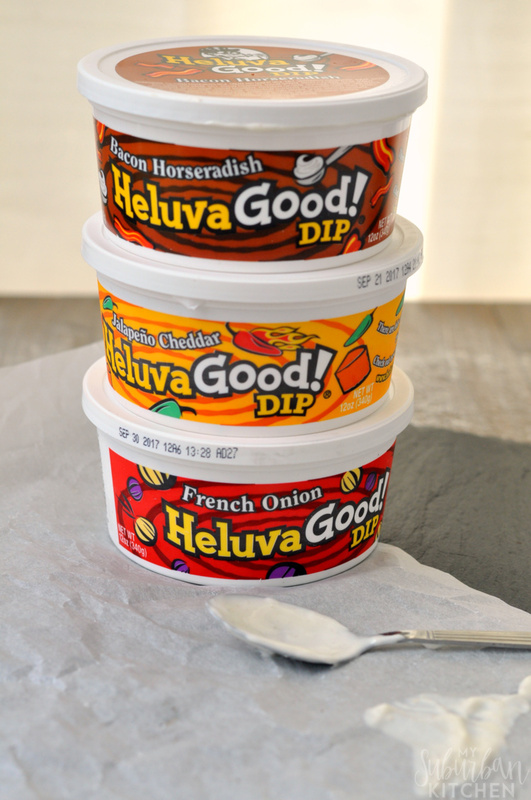 offers a bunch of flavors of their amazing dips like French Onion, White Cheddar & Bacon, and Bodacious Onion. I chose the Bacon Horseradish to go with our cauliflower tempura and it was phenomenal with it. The dips are all make with real sour cream and loads of flavorful spices so you can’t go wrong picking any of the flavors. 1. Bring large pot of water to boil. Add cauliflower and cook for 1-2 minutes. Remove from water and place in large bowl of ice water to stop cooking. Remove from water and let dry. 2. Fill a large pan with approximate 2 inches of oil. Bring to temperature of 360 degrees. 3. While oil heats, mix together egg yolks and cold water. Whisk in pepper, crushed red pepper and salt. Using a fork, mix in cake flour until just mixed. Place bowl of batter in a larger bowl filled with ice water to keep cold. 4. Working in batched, dip cauliflower pieces in tempura batter and place into pan with hot oil. Let cook for 2 minutes and then turn over and cook for another 2 minutes or until lightly browned. Remove from oil and place on paper towels. Repeat until all cauliflower is cooked. Dust finished pieces with chili powder and serve with Heluva Good! dip. 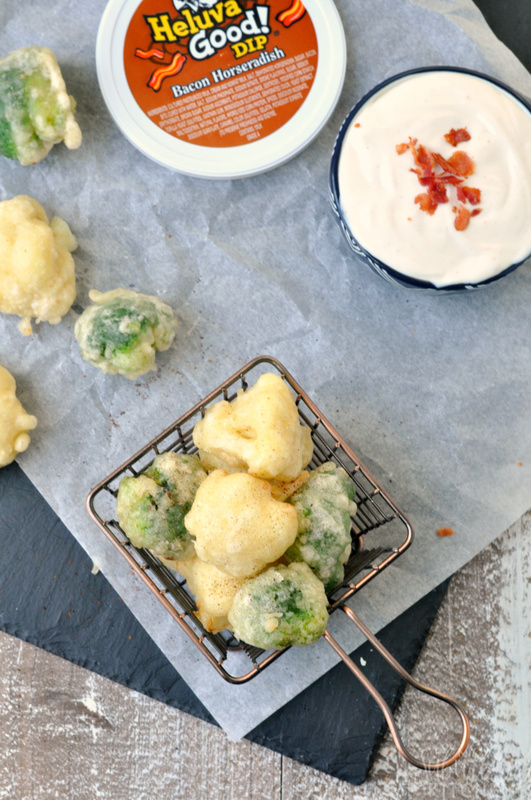 I usually make some broccoli tempura along with my cauliflower tempura. The process is exactly the same but you get to skip the blanching step since broccoli cooks faster than cauliflower. Both are fantastic dippers. What are your favorite party dips? Have you tried Heluva Good! dips? You can find many of their delicious flavors at a store near you! Bring large pot of water to boil. Add cauliflower and cook for 1-2 minutes. Remove from water and place in large bowl of ice water to stop cooking. Remove from water and let dry. Fill a large pan with approximate 2 inches of oil. Bring to temperature of 360 degrees. While oil heats, mix together egg yolks and cold water. Whisk in pepper, crushed red pepper and salt. Using a fork, mix in cake flour until just mixed. Place bowl of batter in a larger bowl filled with ice water to keep cold. Working in batched, dip cauliflower pieces in tempura batter and place into pan with hot oil. Let cook for 2 minutes and then turn over and cook for another 2 minutes or until lightly browned. Remove from oil and place on paper towels. Repeat until all cauliflower is cooked. Dust finished pieces with chili powder and serve with Heluva Good! dip.